General Clinton and General Burgoyne commanded a battery of 28 pound cannons here during the battle on Breed's Hill (now known as the Battle of Bunker Hill). The high location would have allowed them to fire on the entrenchments on the hill, while General Howe led the troops in the attack farther to the east. Some of the tombstones in the cemetery were fired upon and bear the marks of musket balls. 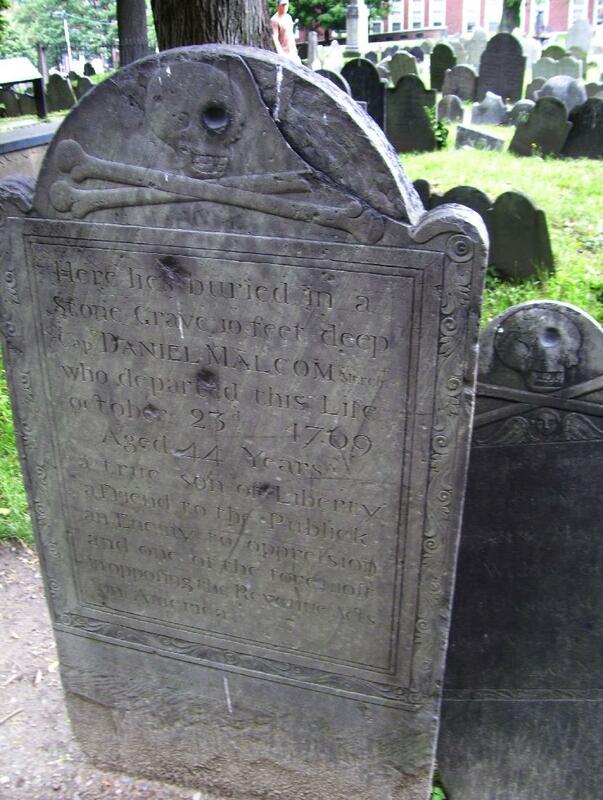 The most famous of these is that of Captain Daniel Malcolm whose epitaph calls him a "true son of liberty." The gravestone is mentioned in Oliver Wendell Holme's poem, "Grandmother's Story of Bunker Hill (As She Saw it From the Belfry)". 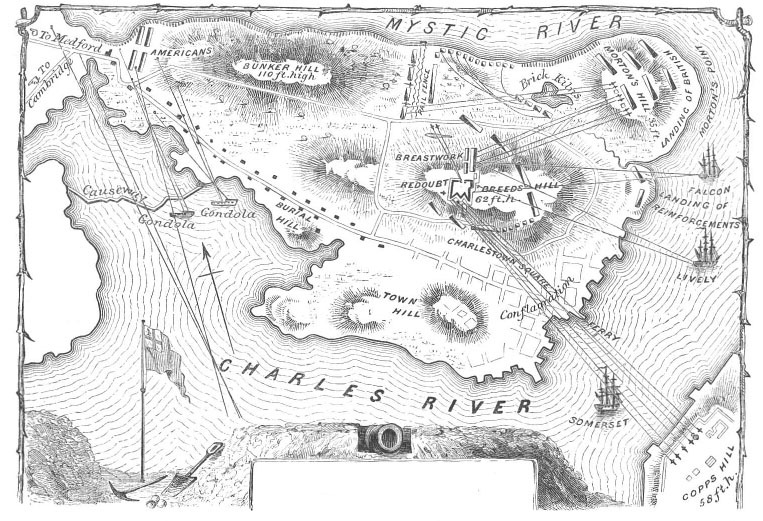 Map by Benson Lossing showing the battery on Copp�s Hill and the landing site on Moulton�s Hill. Prince Hall was freed by his master in 1770 after 21 years of slavery. Five years later, he applied to become a member of the Freemason's in Boston, but was refused. However, the British granted what the Americans had denied; he and 14 other free black men were accepted by a lodge attached to the 38th foot regiment on March 6, 1775. He thus became the founder and master of the world's first black Masonic Lodge. Some sons of "liberty" and enemies of tyranny could not see the irony in the demands of colonists to maintain the institution of slavery. African Americans remaining loyal to the Crown were offered their freedom and many were transported abroad after the war (in spite of American demands to have them returned to their "masters"). 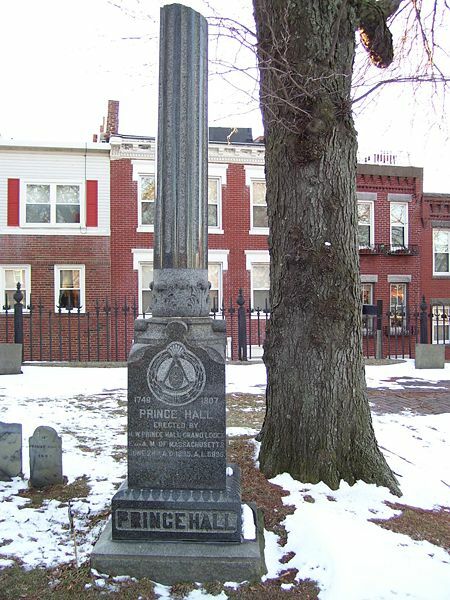 Prince Hall remained in Boston and became a noted activist for the rights of African Americans. He was instrumental in abolishing slavery in Massachusetts in 1788. A monument to him stands in the Copp's Hill Cemetery.